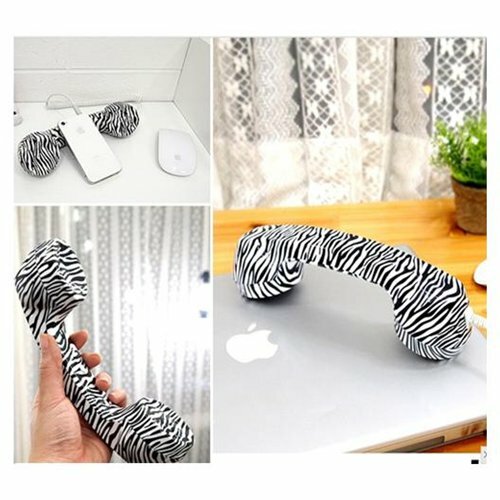 This Zebra retro handset combines high style with high functionality, uniting the comfort and safety of a handset telephone with the convenience of the mobile phone. It allows you to have lengthy phone conversations while eliminating most of absorbed radiation when directly using your mobile phone. Compatible with 3.5mm jack mobile phones, including iPhone, BlackBerry, iPad, Sumsung, Motorola, HTC, Nokia, etc. Dimensions: 21.0 cm x 6.2 cm x 6.8 cm (approx). Eliminates up to 99 percentage of the radiation absorbed compared to a direct use of mobile phones. Noise-reducing technology for a crisp and polished sound Luxurious soft-touch finish for ultimate comfort and feel. One touch button for convenient pick-up/hang-up directly from the handset (not all mobile phone support function).